The Nikon GP-1 GPS Unit allows you to "geotag" your images with valuable information such as latitude, longitude, altitude and time information. For those who are on the go such as outdoor photographers, nature shooters, climbers, sports enthusiasts, news hounds, surveillance people, real estate agents and many more, this item provides a valuable way to accurately document when and where you shot a specific photo. Nikon sells the NIGP1 as a geotagging device. It comes with a 10 pin connector to transmit the data to D200, 300, 300s, 700, D2, D3 and D800 / D800E. However, when using this, the 10 pin connecter for the camera is occupied and does not allow you to use a Nikon MC30 or MC36 remote cord. However, this problem is easily solved. 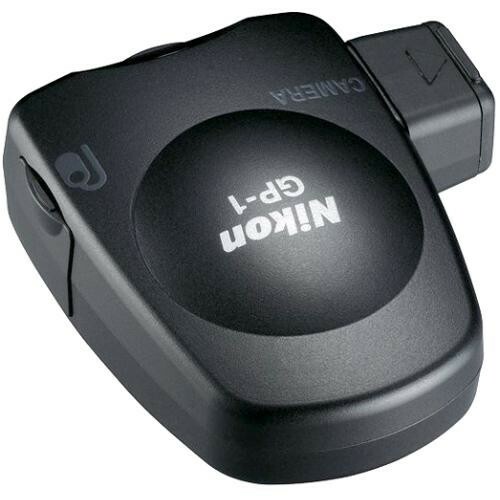 The Nikon remote cord for the D90, the NIMCDC2, can be plugged into a second port on the NIGP1 thus allowing you to take photos without touching the camera. Box Dimensions (LxWxH) 6.2 x 2.5 x 3.0"
GP-1 GPS Unit is rated 4.1 out of 5 by 178. Rated 4 out of 5 by Anonymous from Works as Stated I've been using the GP-1 for probably six weeks now. The biggest thing I was worried about when I purchased the unit was the time it would take to associate with the satellites. I would say on average it takes 30 seconds or so - it obviously takes longer if I'm in woodlands or in buildings (yet close to windows). Once in a while it takes a couple minutes. The only complaint I have is Nikon's pricing of the unit. It's pretty steep for the small function it provides, however there aren't many other options out there yet. Also, beware that the unit will noticibly use power from the camera's battery, just as the manual states, especially if I use the mode that makes the satellite sync faster. Rated 5 out of 5 by Anonymous from Great product, cable questionable I use this to document where I have taken a photo. Signal acquisition is pretty good. When first plugged in, can take a minute or more, but afterwards the green lite has a continuous lock. Locations come up automatically when I put my photos on my online photo sharing site. Only problem I have with this product is that the cable may be a problem. I can be using this GPS and out of nowhere, the camera does not recognize that it is plugged in anymore. I wiggle the cable a little and then the camera sees the unit and starts the sattelite acquisition process again. Otherwise, this seems to be a great product and does exactly what it says. Rated 4 out of 5 by Dan from Plain and simple: IT WORKS Plugged into my D200 it just worked, right from the start. I was pleased that the remote release plugged into the GP-1 works just like the 10 pin release. It worked very well for a trip to Michigan's UP, some of it in deep woods. It would locate and be ready to go within 3-5 seconds if camera was turned off and then on again without substantial change of position. If there was a substantial move, then it would locate satellites within 30 seconds at the most. The con to the unit is increased battery usage. Nothing is free! Used with Nikon View NX it' really great to see the exact location pop up on the map. Rated 5 out of 5 by Larry from For me It's a time saver! In the past I always carried a Garmin GPS Map 76CS unit with me when I traveled. I would write down the coordinates in a notebook then later match the photo with the location. When hundreds of photos are involved it proved to be quite time consuming. Now it's automatic. The GP-1 GPS unit finds and locks on satellites just as quickly as my previous handheld GPS unit and there is no notebook and no extra time writing. The unit is small and light and the ten pin connector connects easily and securely to my D800E. I am very pleased with it! As to battery life I always carry extra fully-charged batteries with me. So far I have never needed to change batteries. I turn off my camera when I'm not shooting. Rated 5 out of 5 by Louie from it works It works as advertised. On a clear day, I stood in middle of large parking lot with my iPhone and Nikon D700 with this GPS attached and made a photo with each. After moving to computer and opening in PhotoMechanic, I zoomed in as far as Google Maps would allow using satellite photo. The photo shot with Nikon's GPS was exact to the very parking space, the iPhone photo (using the built in GPS) was off by about 20 feet. I honestly don't think the Nikon unit was off by more than a foot or two. Pretty amazing, IMHO. Obviously, like any GPS, it won't work as well under heavy tree canopy or between tall buildings, but it has performed well in those situations also. Rated 4 out of 5 by Anonymous from still getting used to it... Seems fine, easy to hook up and start using. Slower than I thought it would be to get a signal. Even if I've had only a short break between shots, it can take second or two to find a signal again. Doesn't matter if you're on a tripod getting a landscape but it does if you're walking and see a quick candid shot (I'm a travel photographer). If I'm walking and don't take a shot for 15 minutes, it can take more than 10 seconds to find a signal again. I didn't think this would be the case if the GPS was always working as suggested by comments I've read about it drawing power even when shutter is not depressed but camera is on. Look forward to them being built in. Rated 3 out of 5 by Richard from Nikon GP-1 works in Antarctica Used on Nikon D300. Very compact. Easy to install and remove. Used in Antarctic Peninsula below 65 degrees South. It often took up to 20 min to find enough satellites to get a reading.This involves pressing the shutter button half way down every 5 sec. so that it would keep looking. Elevation was also often off by 10-20 meters, even with most readings at sea level. Once on target it was OK until moving a few miles then same long period to get first fix again. It was also patchy in transferring the fix to the image data. The green light often lied about data OK. This is an extreme situation and better results were seen in more populated parts of the globe where more satellites are around. Rated 5 out of 5 by bob_s281 from Worth every $$$ I purchased this unit for a recent trip to Vietnam. I didn't want to worry about logging my photos or later trying to figure out where I was. The GPS unit linked up within about 35 seconds and worked flawlessy! Imported my pictures into iPhoto or Aperture and, wa-la, there was my exact course while taking photos. I read several comments about battery drain, I never had a problem. I use a battery-grip and two fully charged batteries last a whole day (plus some), with camera on the whole time and GPS linked. We went out for a one-day expedition and I took nearly 2,500 photos without turning my camera and GPS off, and still had plenty of battery life. Worth every dollar I spent and then some.